What a fascinating name for a business, I found this business intriguing while I was doing business listings. Prof. Arena was obviously a very flamboyant stylist with a taste for the outrageous. 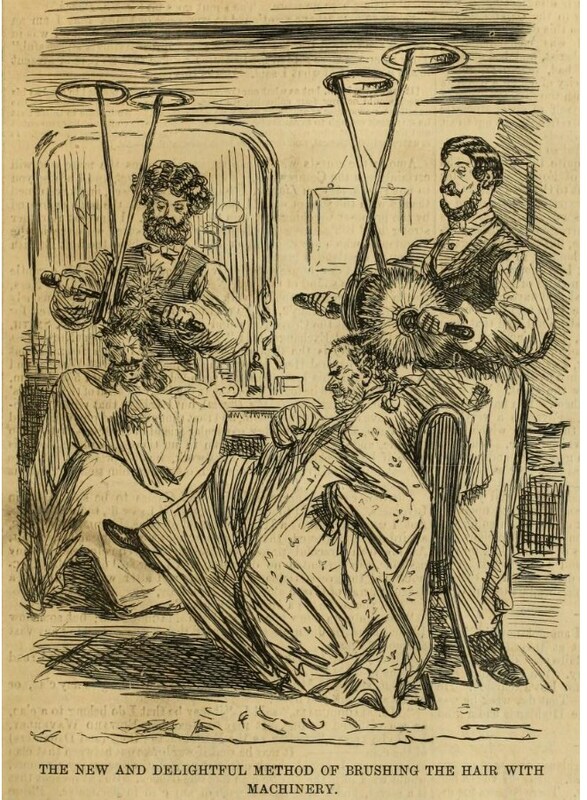 IN the Maryborough Chronicle on the 19th Feb 1883 the following advertisement appeared..
A hydraulic hair brushing machine.. the mind boggles at what this machine was.. so with a little googling we found the picture on the left..
A very stimulating experience we are sure. We also found that Prof. 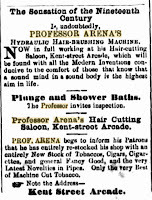 Arena was advertising Plunge and Shower baths and of course in the manner of many Hair Cutting Saloons of the time they were also the local tobacconist and his store stocked a large range of Tobaccos, Cigars, Cigarettes, and general Fancy Goods, and Latest novelty type pipes..
A sad accident occurred last night at the corner of Adelaide and Kent St. A man furiously riding round the corner, the horse fell on the top of him, knocking him senseless. Immediate assistance was rendered, and the man relieved himself from his dangerous position, was taken to hospital. He was for some time unable to explain how it occurred. On his saddle a parcel was fastened to the pummel, which the Dr. said was the cause of his life being saved. The magic parcel contained two boxes cigars, a box of cigarettes, and a choice selection of meerschaum pipes, briar pipes, cutlery, and fancy goods too many to mention. After a few hours the sufferer regained consciousness, and the Dr. made some inquires from him as to where he was going to and how the accident occurred. 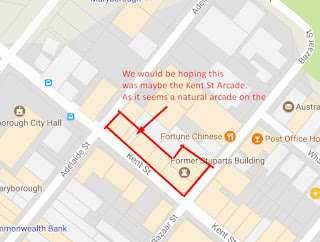 He replied he lived in the bush, and that he had heard that Professor Arena had received a large consignment of stock from the southern colonies, and also his new cushions for his billiard table, from Alcock of Melbourne. Knowing that his cigars, cigarettes, tobaccos, pipes and fancy goods, are the best ever imported into Maryborough. I came in to have a shave, hair cut, a bath, and my hair brushed by Machinery – which is the pleasantest sensation ever felt by mortal man. then I had a game of billiards on his table, which I would consider the best in the colony; then I purchased the articles contained in this valuable parcel, and was hurrying home filled with joy, when the horse fell on me. 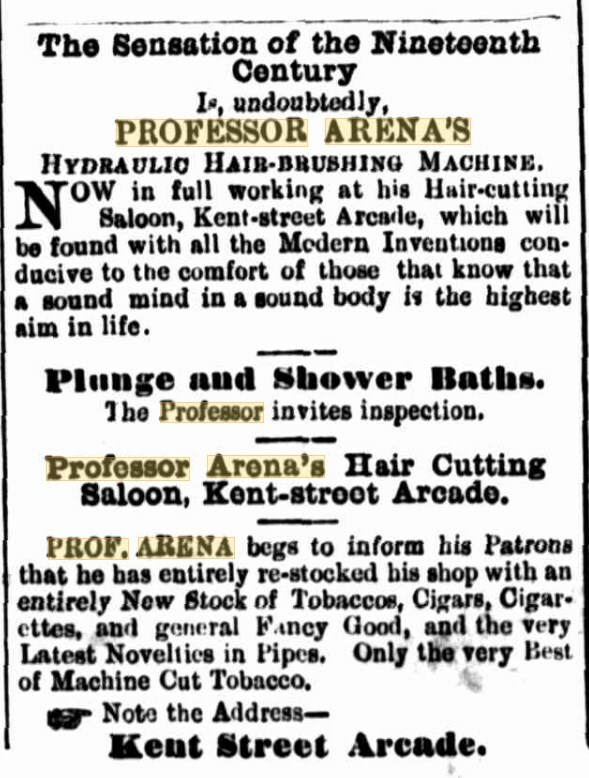 Doctor, I shall strongly recommend all my friends and the public generally to visit this the only Establishment in the Colonies where anyone can receive the greatest amount of joy and comfort for the least expenditure, for Professor Arena’s charges are most moderate. doctor, may I home home now? 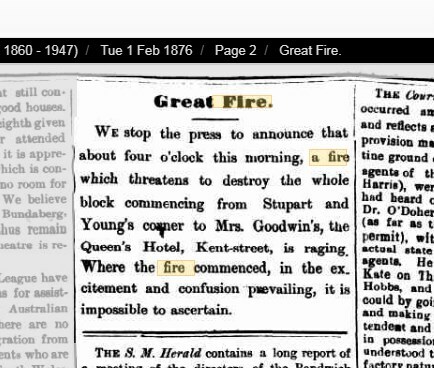 15/3/1877 Brisbane Courier. Alfonzo Arena, of Maryborough, hairdresser was on Monday adjudged insolvent upon his own petition. The first meeting of creditors in the estate was fixed for the 23rd instant, the usual statement of liabilities, and c. to be filed by the 21st. 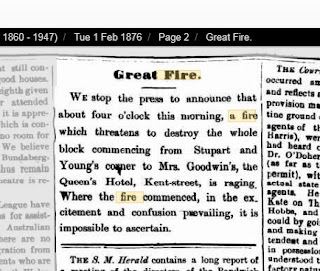 Side note: There was a Belle Vue House Private boarding house and residence located opposite the gardens in Maryborough A Arena proprietor.. was this the same building.or person. 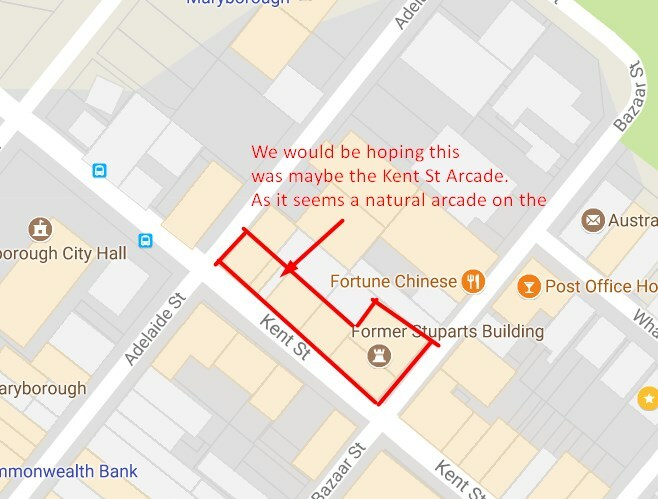 We believe Alfonzo left Maryborough after the insolvency but have not finished with this flamboyant mans story yet.